We are finally back from a crazy couple of weeks away from home and I am happy to be settling back in to our normal routine. When I was younger, my mom wouldn’t let us leave for vacation until the house was clean and all of our beds had clean sheets on them and I always hated it! As an adult now I realize how smart she was (shout out to my mom! lol) because I now do the same thing. Before we left I cleaned the house from top to bottom, even though it was a pain and I was like a crazy person trying to get it all done. Walking into our spotless house after 14 days away was SO nice and sleeping in our OWN bed (we slept in five different ones while away!) with fresh sheets was perfection! I got all our laundry done last night and we got a good night’s sleep and woke up feeling ready to go this morning. I thought this would be a great recipe to share because it’s SO delicious and it doesn’t take a lot of time or ingredients to make it. My husband is a dessert kind of guy and lots of nights I come up with things using what we have laying around the kitchen. A few weekends ago we had some pineapple left from the beach, blood oranges from skinny margaritas (get that recipe HERE) and some frozen fig greek yogurt so I pretended I was on an episode of Chopped and made this dessert. This sauce would be good on just about anything but I loved the combo of it with the caramelization the pineapple got from grilling it and the frozen yogurt tied everything together! Start off by slicing up your pineapple.. we had about 1/2 a pineapple left from the beach earlier that day, so that’s what I used. Cut away the outside of the pineapple, cut into about 1/2″ slices and remove the core from the center. Sprinkle both sides of the slices with cinnamon and a little bit of sugar (I made a mixture that was 1 tbsp cinnamon and one packet of Splenda) and put onto a preheated grill (1), we have an indoor one that we love. Grill on both sides until you get good grill marks and a little bit of caramelization from the sugar then set aside. To make the sauce, melt 2 tbsp unsalted butter in a skillet over medium-high heat (2) and then add 1/4 cup dark brown sugar (3). Continue to stir until the sugar is just melted, then add in the juice from 1/2 a blood orange (4) and stir until incorporated. Pour in a generous splash of bourbon (or scotch or whiskey). The idea here is that you want to burn off the alcohol taste while keeping the intense flavors of the liquor, which you can do a couple of ways: If you have a gas stove, VERY carefully tip the pan so that the flame touches the liquor which will ignite it. 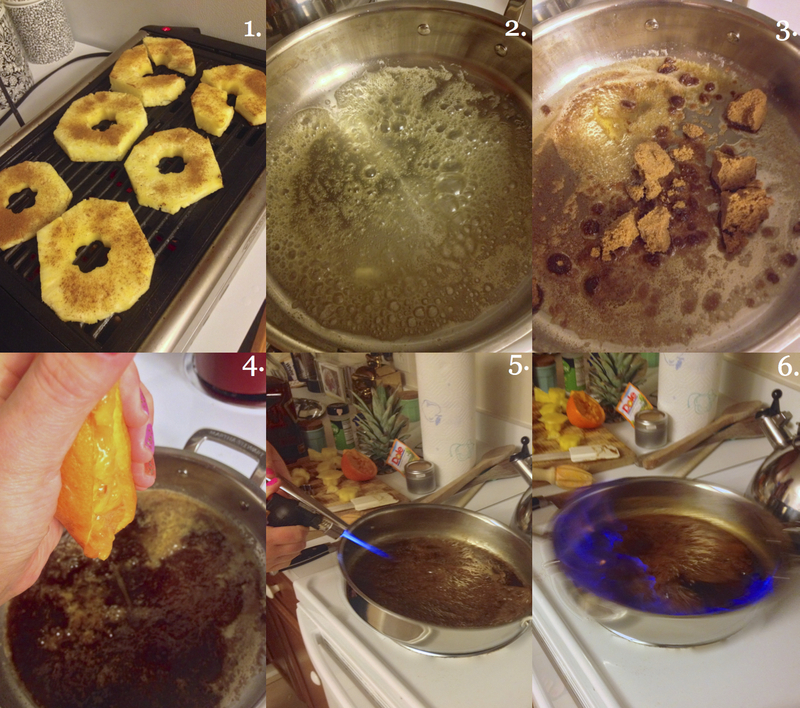 If you have an electric stove (like we do), you can do the same thing using a brûlée torch (5). Once the liquor catches fire, carefully shake the pan back and forth until the alcohol burns off (6). To build the dish, stack the grilled pineapple in a shallow bowl and scoop frozen yogurt (or ice cream) into the center of it. Pour some of the sauce over top and then add another half-piece of pineapple on top! Sprinkle both sides of the pineapple slices with the cinnamon and sugar and put onto a preheated grill. Grill on both sides until you get good grill marks and a little bit of caramelization from the sugar then set aside. To make the sauce, melt the butter in a skillet over medium-high heat and then the brown sugar. Continue to stir until the sugar is just melted, then add in the juice from the orange and stir until incorporated. Pour in the bourbon (or scotch or whiskey). The idea here is that you want to burn off the alcohol taste while keeping the intense flavors of the liquor, which you can do a couple of ways: If you have a gas stove, VERY carefully tip the pan so that the flame touches the liquor which will ignite it. If you have an electric stove, you can do the same thing using a brûlée torch. Once the liquor catches fire, carefully shake the pan back and forth until the alcohol burns off. 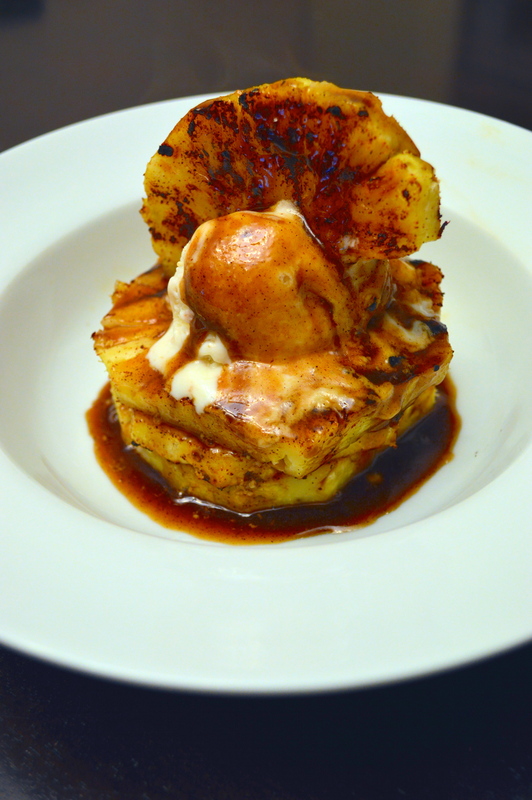 To build the dish, stack the grilled pineapple in a shallow bowl and scoop the frozen yogurt or ice cream into the center of it. Pour some of the sauce over top and then add another half-piece of pineapple on top! Lol I find myself thinking that a lot as I get older, our moms really did know best! Such great alternatives for sugar… I use honey in place of sugar a lot of times never tried sucanat though! That looks gorgeous, dark and decadent – what a dessert. I’m also loving pineapple at the moment. Especially pineapple juice! Thank you! I try to switch it up and buy different fruits each time but I have found myself loving pineapple most lately too! LOL right? I think it’s so funny the stuff I used to think was crazy now makes perfect sense! love anything with pineapple. this looks amazing!